From tracking farm animals to supporting film & TV production, we’ve made many custom-tailored web applications over the years. And our tools for managing web content are beloved by their users. 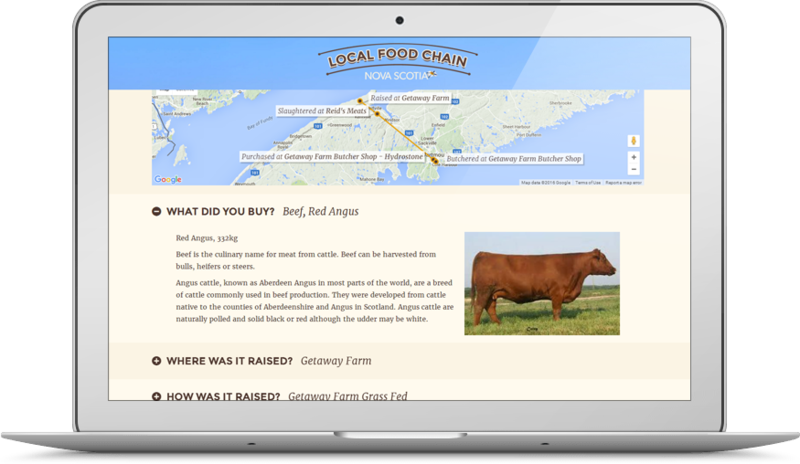 This pilot project, produced by Getaway Farm with support from the Nova Scotia Department of Agriculture, is part of a trend toward consumer food traceability. People want to know not just what they’re eating, but after years of feeling disconnected from the food chain, those buying meat want to know where the product they’re eating was raised, what it ate, and how it got from the farm to the table. Bad Math designed and built an end-to-end application to enable every participant in the local meat food chain - farmers, butchers, processors, distributors and retailers - to contribute to a data trail and be traceable by consumers. That trail leads right up to a sticker on the package handed to the customer, which they can scan with their mobile device to see the full history of their purchase, starting with its upbringing and continuing through the stories, practices and methods of all the parties involved in getting it to the store. Bad Math got its start making web-based applications for the movie and TV industries, and our portfolio of client-tailored apps has continued to grow since. We’ve built client approval, collaboration and review tools, footage library systems, DVD-burning appliances, and video-centric content management systems. All easy-to-use tools that solve real problems for a broad range of industry clients. “I’ve never enjoyed preparing publicity for our company as much as I do using your CMS tools. I’m not kidding. I actually have to pull myself away from it at night to go to bed. A web presence is only useful when it’s kept up-to-date, and a key to staying current is an updating process that’s as frictionless as can be. When we build websites, they come with a custom-made suite of tools to make it as easy as possible to maintain content without the need for any technical expertise. Interfaces are friendly, usable, and intuitive. The tools are always designed around the nature of the content - a site is never designed around the limitations of a back-end platform - ensuring utter freedom in layouts and content in site design. Best of all, they take the labour out of putting material online.